Hero to the world the Precursors left behind, Jak has the special ability to channel the magical force called "Eco" that is imbued in everything on the planet. For those who haven't played it, Jak and Daxter is kind of the rival game to Ratchet & Clank. Big-eared protagonist, silly sidekick, mad weapons, all that. Jak is apparently some kind of elf, judging by his ears. Those, his green hair and the goggles pushed up onto his forehead are all one piece. 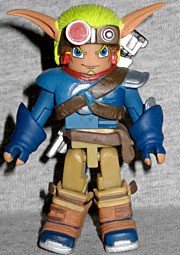 This figure's design is based on Jak II, so he's got huge new boots, large blue gloves, a brown belt and a big complex chest cap with a silver shoulder pad and several brown straps. 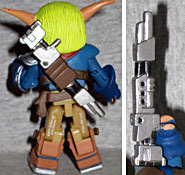 Jak is armed with his trademark weapon, the Morph Gun. In the super-silly Ratchet & Clank, that would be a gun that morphed your enemies into something - in Jak and Daxter, it's a gun that morphs into different kinds of guns. This appears to be the "Blaster" mode, the first upgrade you get in the game. It's basically the standard Morph Gun design, with a longer barrel. Jak can either hold it in his hand, or store it across his back. 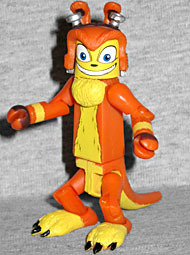 Transformed into an ottsel (half otter, half weasel) by "Dark Eco," Daxter is Jak's sidekick and closest friend. Always a troublemaker, smooth talker, and credit-taker, and a real hit with the ladies. Yes, like Cobra Commander, this weirdo was once a man. He gets a unique torso - it's skinny like the Theatre Ghost's, but only has two shoulders, not four. This hip block is also new, and is molded with his long, furry tail. His arms are normal, but his legs are actually Minimate arms (so they're round rather than square) and he has new feet that make his legs bend deeply. The head is standard, with a manic smile painted on his face, but he gets a new piece to create his ears, eyebrows and goggles. He also gets a tuft of fur that fits over the neck peg and hangs against his chest. The overall design is great, but like Clank, the reality of Minimate design mean he's a lot bigger than he should be. The Playstation Minimates weren't a huge hit - there was only one series, which went to clearance at TRU and still sold slowly. Jak and Daxter are a nice, colorful set, and I'm sad we never got a Spyro the Dragon or Sly Cooper to go with them. This entry was posted in Art Asylum, MMMR and tagged Minimates. Bookmark the permalink.